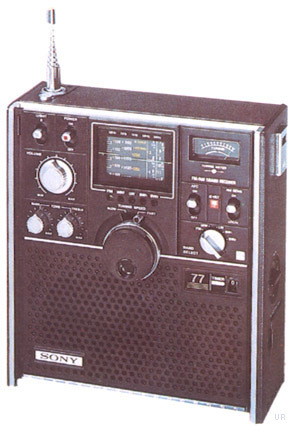 The Sony ICF-5800L Captain 77 portable receiver covers longwave (150-285 kHz), medium wave (520-1605 kHz), shortwave (1.6-4.5 and 4.5-12 MHz and FM (87.5-108 MHz). There are separate controls for Bass and Treble. There is an AFC switch for FM and a DX/Local switch for shortwave. This radio has a built in timer that will turn the radio on and off within 60 minutes. This radio has a tuning meter plug two tuning speeds. There are external antenna terminals for the FM and shortwave bands. Operation is from four C cells, 6 VDC or optional AC adapter. 8.25 x 9 x 3.385 inches. 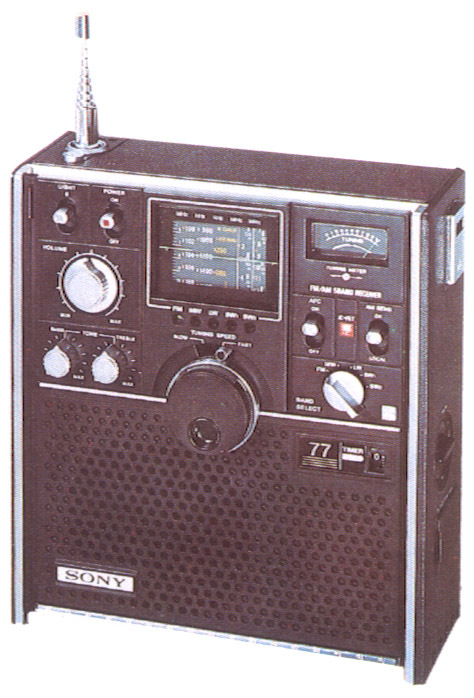 The Sony ICF-5500M Captain 55 is similar.